With a classic shape and durable design the Royal Teak Collection 10' Deluxe Market Umbrella is a high mark in a luxury outdoor experience. The umbrella frame is constructed from Royal Teak's classic Grade A wood with stainless steel hardware, while the umbrella itself is manufactured with beautiful fabric for that high-end finish and silhouette. Each umbrella features water- and dirt-repellant fabric reinforced with authentic leather. Pair this patio umbrella with any of Royal Teak's umbrella-enabled tables or furniture sets or let it stand alone with the Market Umbrella Base. Thank you for your inquiry. 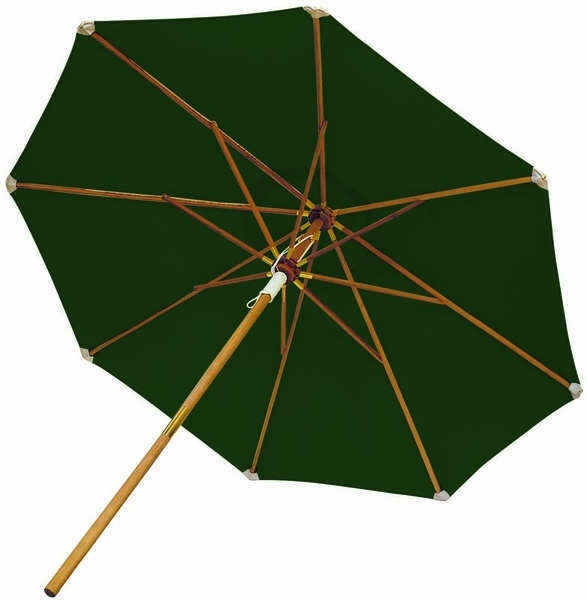 The Royal Teak Collection 10' Deluxe Market Umbrella - UMBG has a 2 inch diameter pole. sturdy and well made, it looks...we'll see!